If you’re confused about those tiny numbers and equations, it’s simple – the COP refers to the coefficient of performance. This is a ratio of useful heating/cooling offered against the output. To clear the confusion, just remember this: higher COPs mean lower operating costs. 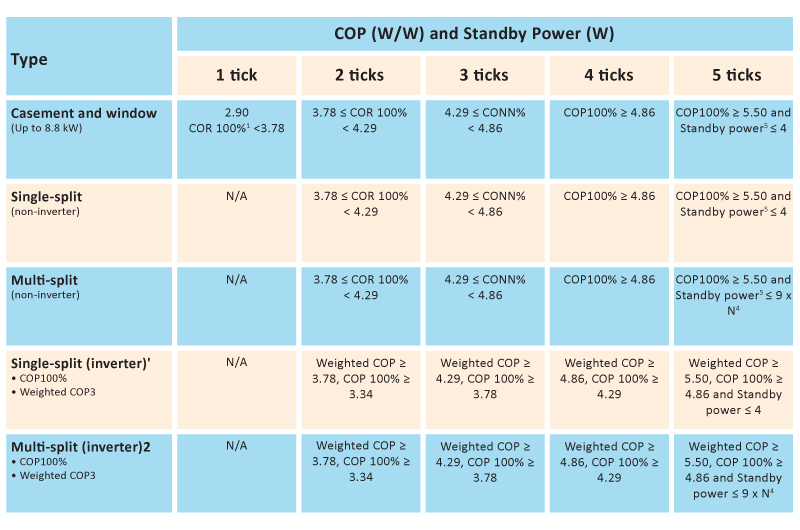 Hence, according to the table, the more ticks it has, the more energy-efficient the model is. Models with fewer ticks require more energy costs over their lifespans, guzzling greater energy to keep their systems running. This local website offers a free calculator to determine the life cycle costs of different ticks. As seen above, despite higher initial costs for the 5-tick model, its overall lifespan and life cycle cost is the lowest amongst the three. Therefore, you can expect higher energy savings from its high energy efficiency. To sum it up, here are the key differences between these ticks: the lifetime energy and life cycle costs differ due to different energy consumption levels. The lesser the ticks, the more energy consumed and the higher costs it will incur. So, the next time you’re considering which model to get, use this as a guide to make your decision! Look beyond upfront costs to make better choices.